Nepal is formally called the Federal Democratic Republic of Nepal. It is a land locked nation in South Asia. It is situated in the Himalayan region and at its northern flank is the People’s Republic of China, and at its southern, eastern, and western borders is India. Its capital city is Kathmandu. The most prominent geographical aspect of the country is its mountain regions in the northern part including the eight highest peaks in the world, Mount Everest which is 20,000 feet above sea level and comprises of 240 peaks. The form of government practiced in the nation for nearly all of its history is a monarchy reigned by the Shah dynasty. Recently, in the year 2006 because of a decade long civil war with the Communist party of Nepal and the mass rallies of various political organizations, the monarchy was eradicated ending with its last ruler Gyanedra Shah and a new system of governance was favored. The Federal Democratic Republic of Nepal was inaugurated in 2008 with its first president. 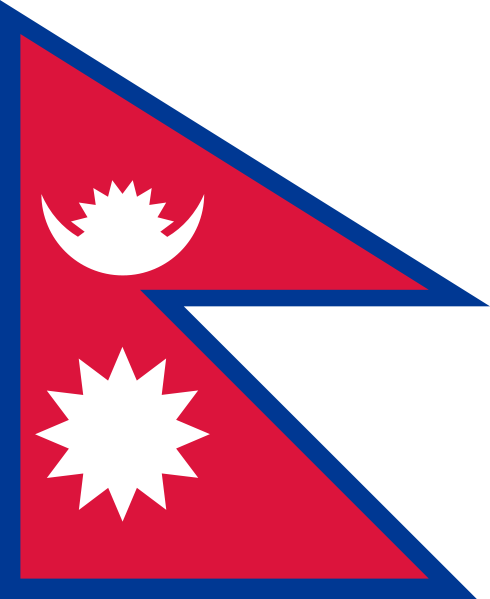 The flag of Nepal is known as the only flag in the world that is not quadrilateral in shape. The flag is a blend of two single flags or pennons. It is like two triangles combined, the upper triangle is a ninety degree triangle with its longer side at the bottom while the other triangular shape is placed at the lower portion with the shorter side at its bottom. The color of the fag is crimson red similar to the color of the national flower, the rhododendron. Red also stands for conquest in war. The blue in the borders stands for peace. The upper part has a star and crescent moon combined while at its lower portion is a symbol of the sun. Before the year 1962, the sun and moon emblems have human faces but the flag was revised when it was modernized. The flag has elements with Hindu origins in the design.